Well, this episode was disappointing. 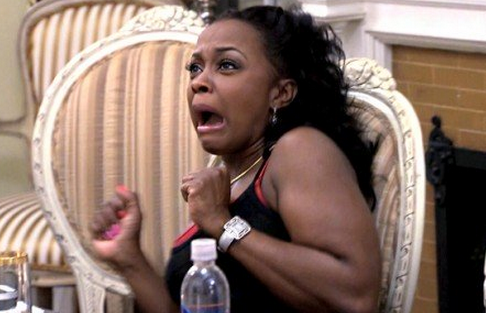 I was looking forward to some fukkery on this week's Real Housewives of Atlanta show. I've been in bed with the cooties all day so some shade, reads and tomfoolery probably would have made me feel a ton better. I caught myself dozing off a few times so this recap might be missing some key pieces, just bare with me y'all! Nene Leakes is such a miserable heffa, ain't she? I was so annoyed when she started to judge Cynthia Bailey (a.k.a. her "best friend") about how she was raising her daughter, Noelle. You see, Noelle has a boyfriend now and Cynthia drives them to the movies so they can go on dates. Nene thought that the fact that Noelle even had a boyfriend was unacceptable. I agree with Nene, I think it is unnecessary and inappropriate for a child to be actively going out on dates with someone at that young of an age but it is not Nene's place to make a comment about how Cynthia chooses to raise her daughter. And isn't Nene the broad that had a son arrested for stealing razors from Walmart? Cynthia runs off crying and Porsha Stewart and Kenya Moore go to console her. In the midst of trying to make Cynthia feel better, Porsha and Kenya have a moment. They start to connect over their longing to have children and Kenya even shares a little about her childhood and how her mother never wanted to have anything to do with her. It was a pretty touching moment but I wonder how long these two will continue to get along? Kenya is feeling some kind of way after she has her bonding session with Porsha so tries her luck with burying the beef with Phaedra Parks. Unfortunately, Phaedra ain't trying to hear nothing Kenya has to saw. Although she agrees to move on and forget about the past, Phaedra won't be inviting Kenya over for ladyfingers and sweet tea anytime soon. The ladies go to a drag show and Nene is in her damn element. She is acting a hot azz queeny mess, drunk, stumbling, and telling the drag queen that Mynique Smith needs lessons on how to be a black girl. I don't care what anyone says, they cannot convince me that the ladies went to the drag show and then came back home to eat that Southern feast. Nope, nope, nope! They clearly ate dinner beforehand but whatever, that's not important. Porsha shares with the group that she texted Kordell to see if he wanted to meet up and talk. Kordell asked her what she wanted to talk about and Porsha didn't know how to respond. While she's discussing with the ladies on how she should reply to his message, Kandi Burruss secretly grabs Porsha's phone and replies to Kordell's message with the word, "Us" (as in, Porsha wants to talk to Kordell about their relationship). Now the dumb birdy Porsha is really freaking out as she anticipates what his reply will be. Well, we already know that their divorce was finalized so I'm assuming that Kordell paid that broad dust. In the midst of all of this, a flying cockroach enters the scene and you would have sworn Sasquatch or some other massive deadly beast was attacking them. Everyone was screaming and yelling, weaves were flying all over the damn place. I had to turn down the t.v. that shyt was so annoying! A bunch of howling hyenas I tell ya! Next week's episode looks like a snorefest as well but I'll be tuning in just to see how Peter was spending Cynthia's money without her knowledge (These two are still married? Shocker). Welp, time for me to take this Nyquil and head off to sleepyland. Enjoy your night y'all!